Twitter is foreseen to experience a growth boom in the following years, according to eMarketer. 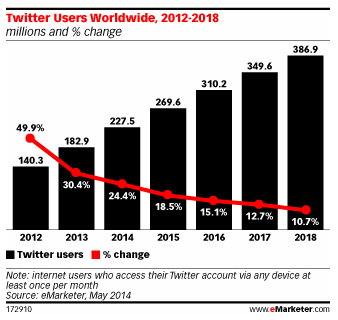 The online marketing research firm says that Twitter’s base will increase 24.4% in 2014 and will continue to grow with two-digit advances until 2018. The prospect sounds exciting, especially for businesses that use Twitter as their main social media platform. The Subsequent Growth: Thanks to APAC? Despite the criticism Twitter continues to receive since going public last year, eMarketer’s reports suggest that the social media platform will still manage to maintain growth in the following years, although in small increments. They state that the number of users in the Asia-Pacific region has already cast a shadow on the figures in North America and Western Europe. This began in 2012, when APAC figures accounted for 29.1%; North America accounted for 28.1%, and Western Europe accounted for 18.7%. Figures changed over the years, but the fact remains that APAC figures are still greater than other regions. What’s staggering about these immense figures in the APAC is that they don’t include the possible number of users in China, due to the country’s current ban on the website. 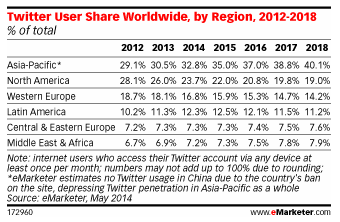 As this year goes by, eMarketer anticipates that the APAC region will go on to maintain a share of 32.8% of all Twitter users. There is a comparable disparity between this figure and North America’s, which is expected to reduce to 23.7% of the user base. The year-by-year projection of the research company leads to forecast that Twitter will reach a 10.7% growth mark, which is equivalent to about 400 million users, in 2018. And by that time, 40% of that number will come from the Asia-Pacific Region. “Growth for Twitter is heavily weighted in emerging markets. India and Indonesia will see the most consistent growth patterns throughout our forecast period, both experiencing increases well above 50% this year,” according to a statement from eMarketer. On the other side of the globe, eMarketer estimates that Twitter’s user base in the US will narrow into single digits by 2015. This means a lot to marketers, of course. With the growing number of users, it would be wise for businesses to start harnessing the functions of Twitter as a marketing tool. It’s not just about setting up an account and waiting for followers to come by. You need to make use of certain techniques. Learn how to reach out to potential and current customers in less than 140 words. Learn the art of linking. Invest in analytics. Contact one of our account managers today if you have any questions regarding the techniques you may need for your clients’ social media campaigns. Don’t forget to sign up and read our blogs for more updates and tips on how you can improve your projects.